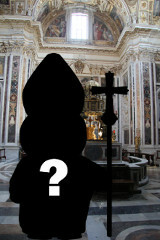 Fresh details have been released regarding the local man who recently tried to infiltrate the Vatican. "His disguise was very nearly perfect," said a spokes-bishop. "His robes were spot on and he was intimately familiar with all our procedures and rituals. He only made one very tiny, but crucial mistake. You see, he disguised himself as the pope, which was a dead giveaway because we've already got one."